Each month we answer some common questions that come up about trail care and construction. This month we’ll be talking about some simple strategies for preparing the trails for winter. Q: When the rains come back, should I go out and look for blocked drains on the trails? A: The grade reversals and drains on our trails catch more than just water. Through the dry summer months, dirt, small rocks, and organic matter (branches, pine needles etc) will collect in the drainage features of our trails, blocking the flow of water, or in some cases, filling in the entire drainage channel. The best time to clear these features is before the rains arrive. In many cases, tools aren’t necessary, just a couple of minutes kicking/dragging material out of the way with a sturdy boot will do the trick. The builders’ tip is NOT to push all the material further INTO the drain, but to drag it OUT and to the side where it will not get washed back in! Q: I’ve seen some faster lines appearing on some of the trails over summer, everyone is using them, is this okay? A: We all like to take inside lines on corners to hold more speed. Unfortunately, sometimes this can get a little out of hand and lead to trail creep (where the whole trail moves over), or even form entirely new lines (braids). Taken to its ultimate conclusion, this process would eventually evolve our fantastic singletrack into completely straight trails with no corners! And, in the short term, the best we can expect of those new “lines” that form during the dry summer months, is that they’ll turn into muddy holes once the rains return as they are no longer following a sustainably built trail surface/design. 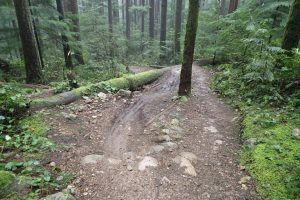 If you see a braid, grab some branches, rocks, or loose forest debris to block the braid to help riders choose the intended purpose built path. It’s also a great idea to make a trail report via Trailforks to inform the permitted builder. They’ll be able to install directing objects to help discourage re-opening of the braid.